Honey bees (or honeybees) are a subset of bees, primarily distinguished by the production and storage of honey and the construction of perennial, colonial nests out of wax. Honey bees are the only extant members of the tribe Apini, all in the genus Apis. Currently, there are only seven recognized species of honey bee with a total of 44 subspecies though historically, anywhere from six to eleven species have been recognized. Honey bees represent only a small fraction of the approximately 20,000 known species of bees. Some other types of related bees produce and store honey, but only members of the genus Apis are true honey bees. Honeybees are one of science's great mysteries because they have remained unchanged for 20 million years, even though the world changed around them. Bees have been producing honey for at least 150 million years. The true honeybee was not known in the Americas until Spanish, Dutch, and English settlers introduced it near the end of the 17th century. Did you know that bees have 4 wings? The honeybee's wings stroke 11,400 times per minute, thus making their distinctive buzz. A bee flies at a rate of about 12 miles per hour. How many eyes does a honeybee have? Five. Honeybees communicate with one another by "dancing". 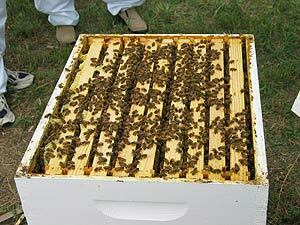 The queen bee is the busiest in the summer months, when the hive needs to be at its maximum strength. She will lay about 1,000 to 1,500 eggs per day. In the cold winter months, bees will leave the hive only to take a short cleansing flight. They are fastidious about the cleanliness of their hive. Honeybees do not die out over the winter. They feed on the honey they collected during the warmer months and patiently wait for spring. They form a tight cluster in their hive to keep the queen and themselves warm. It takes 35 pounds of honey to provide enough energy for a small colony of bees to survive the winter. Honeybee colonies have unique odors that members flash like identification cards at the hive's front door. All the individual bees in a colony smell enough alike so that the guard bees can identify them. Honey bees live in colonies that are often maintained, fed, and transported by beekeepers. Centuries of selective breeding by humans has created honey bees that produce far more honey than the colony needs. Beekeepers harvest the honey. Beekeepers provide a place for the colony to live and to store honey in. The modern beehive is made up of a series of square or rectangular boxes without tops or bottoms placed one on top of another. Inside the boxes frames are hung in parallel, in which bees build up the wax honeycomb in which they both raise brood and store honey. Modern hives enable beekeepers to transport bees, moving from field to field as the crop needs pollinating and allowing the beekeeper to charge for the pollination services they provide. A colony generally contains one breeding female, or "queen"; a few thousand males, or "drones"; and a large population of sterile female “worker” bees. The population of a healthy hive in mid-summer can average between 40,000 and 80,000 bees. The workers cooperate to find food and use a pattern of "dancing" to communicate with each other. The queen is the largest bee in the colony. Queens are developed from larvae selected by worker bees to become sexually mature. The queen develops more fully than sexually immature workers because she is given royal jelly, a secretion from glands on the heads of young workers, for an extended time. She develops in a specially-constructed queen cell, which is larger than the cells of normal brood comb, and is oriented vertically instead of horizontally. She will emerge from her cell to mate in flight with approximately 13-18 drone (male) bees. During this mating, she receives several million sperm cells, which last her entire life span (from two to five years). In each hive or colony, there is only one adult, mated queen, who is the mother of the worker bees of the hive, although there are exceptions on occasion. Although the name might imply it, a queen has no control over the hive. Her sole function is to serve as the reproducer; she is an "egg laying machine." A good queen of quality stock, well reared with good nutrition and well mated, can lay up to 3,000 eggs per day during the spring build-up and live for two or more years. She lays her own weight in eggs every couple of hours and is continuously surrounded by young worker attendants, who meet her every need, such as feeding and cleaning. The male bees, called “drones”, are characterized by eyes that are twice the size of those of worker bees and queens, and a body size greater than that of worker bees, though usually smaller than the queen bee. Their abdomen is stouter than the abdomen of workers or queen. Although heavy bodied, drones have to be able to fly fast enough to catch up with the queen in flight. Drones are stingless. Their main function in the hive is to be ready to fertilize a receptive queen. Mating occurs in flight, which accounts for the need of the drones for better vision, which is provided by their big eyes. In areas with severe winters, all drones are then driven out of the hive. The life expectancy of a drone is about 90 days. A worker bee is a non-reproducing female which performs certain tasks in support of a bee hive. Worker bees undergo a well defined progression of capabilities. In the summer 98% of the bees in a hive are worker bees. In the winter, besides the queen, all bees are worker bees. Workers feed the queen and larvae, guard the hive entrance and help to keep the hive cool by fanning their wings. Worker bees also collect nectar to make honey. In addition, honey bees produce wax comb. Of course, honey is the main honey bee product that we are interested in here at the National Honey Board! In addition, there are a few other products of the hive that are also extremely important. Honey: In the hive the bees use their honey stomachs to ingest and process the nectar a number of times. It is then stored in the honeycomb. Nectar is high in both water content and natural yeasts which, unchecked, would cause the sugars in the nectar to ferment. After the final regurgitation, the honeycomb is left unsealed - bees inside the hive "fan" their wings creating a strong draft across the honeycomb. This enhances evaporation of much of the water from the nectar. The reduction in water content, which raises the sugar concentration, prevents fermentation. Ripe honey, as removed from the hive by the beekeeper, has a long shelf life and will not ferment. Beeswax: Worker bees of a certain age will secrete beeswax from a series of glands on their abdomen. They use the wax to form the walls and caps of the comb. When honey is harvested, the wax can be gathered to be used in various wax products like candles and seals. Pollen: Bees collect pollen in the pollen basket (a concave area on the hind legs of the bee with special hairs to hold the pollen in place) and carry it back to the hive. In the hive, pollen is used as a protein source necessary during brood-rearing. 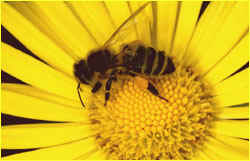 In certain environments, excess pollen can be collected from the hive. It is often eaten as a health supplement. Propolis: Propolis (or bee glue) is created from resins, balsams and tree saps. Honeybees use propolis to seal cracks in the hive. Bees have been here around 30 million years! Foragers must collect nectar from about 2 million flowers to make 1 pound of honey. The average forager makes about 1/12 th of a teaspoon of honey in her lifetime. Average per capita honey consumption in the US is 1.3 pounds. Bees have 2 pairs of wings. 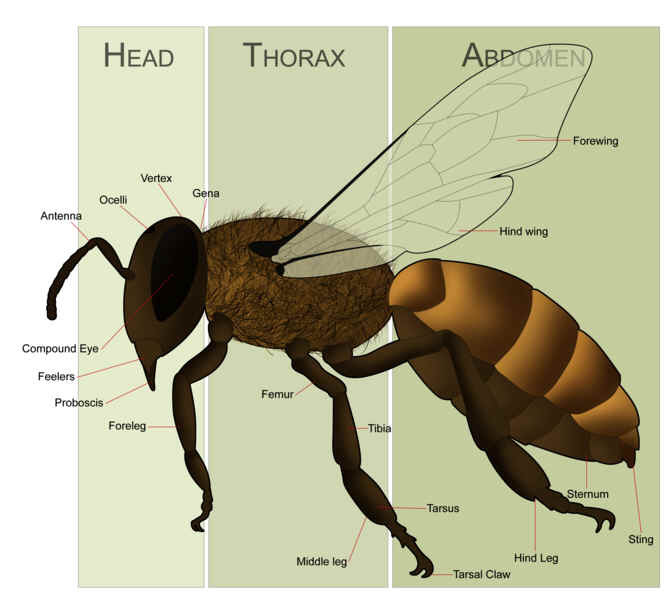 The principal form of communication among honey bees is through chemicals called pheromones. Bees are important because they pollinate approximately 130 agricultural crops in the US including fruit, fiber, nut, and vegetable crops. Bee pollination adds approximately 14 billion dollars annually to improved crop yield and quality. Honey bees are important pollinators in agricultural, urban, and natural landscapes. Bees pollinate about 130 fruit, vegetable, nut, ornamental, and fiber crops in the US contributing about $15 billion annually through improved crop yield and product quality. Hundreds of millions of dollars are additionally generated through the sale of hive products such as honey, wax, pollen, propolis, royal jelly, and venom.